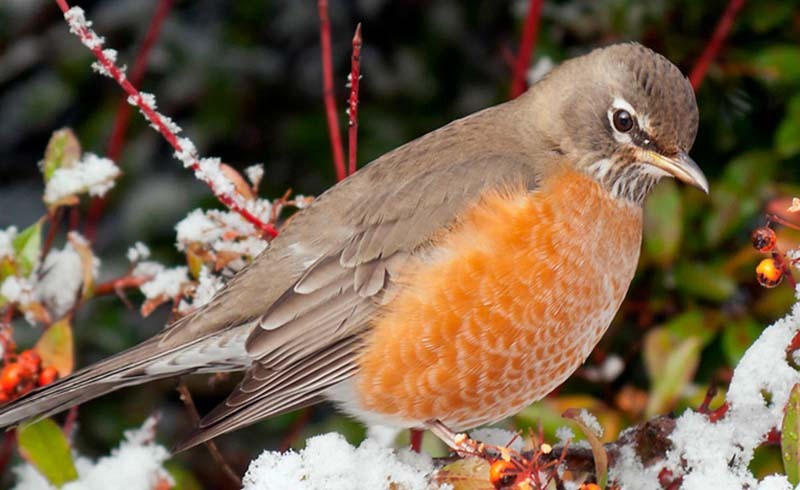 Does your backyard look dead and drab in winter? 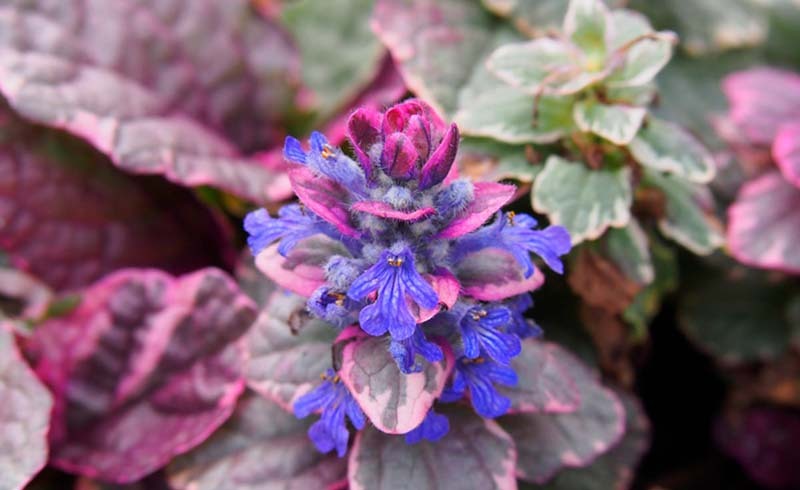 See how to add scent, color and texture to make your garden look fabulous this winter. Not many plants flower during the winter, but those that do add a welcome splash of color in the middle of winter grayness. 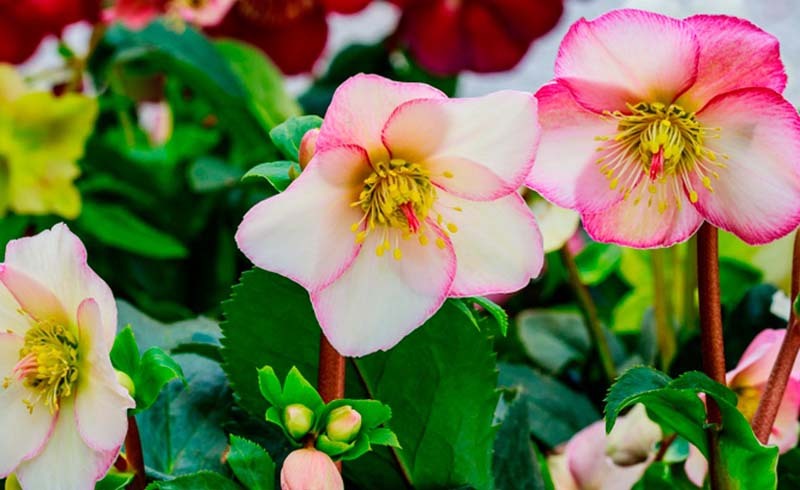 The Lenten Rose or hellebore (Zones 6 – 9) comes in a variety of colors, ranging from creamy white to deep burgundy, while the Iris unguicularis “Mary Barnard’ (Zones 8 – 9) not only has a rich, purple hue but also boasts evergreen foliage and a primrose scent. Winter cyclamen (Zones 6 – 9) can carpet the ground in lovely whites, pinks and lilacs – why not add some other shade-loving plants as well? Some clematis varieties flower in winter too. Check out the clematis cirrhosa range (Zones 7a – 9b), including “Freckles” with speckled flowers, or Early Sensation with a profusion of white flowers. Winter-flowering shrubs are also a great way to add blooms to your backyard in the cold months. Winter-flowering jasmine (Zones 6 – 10) is a perennial favorite, with its delicate yellow flowers borne on stems in November and December. Daphne is another shrub that bears its delicate pink flowers in winter – Daphne odora (Zones 7 – 9)has the added benefit of a wonderful scent. 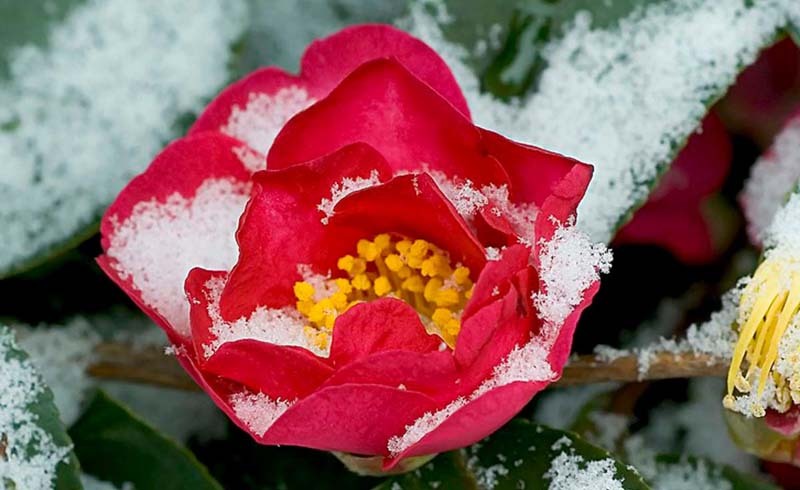 And who doesn’t love to see the glossy green leaves and spectacular flowers of the camellia (Zones 6 – 9) while the snow is still on the ground? Winter is the season when the hard work you put into planting bulbs pays off! 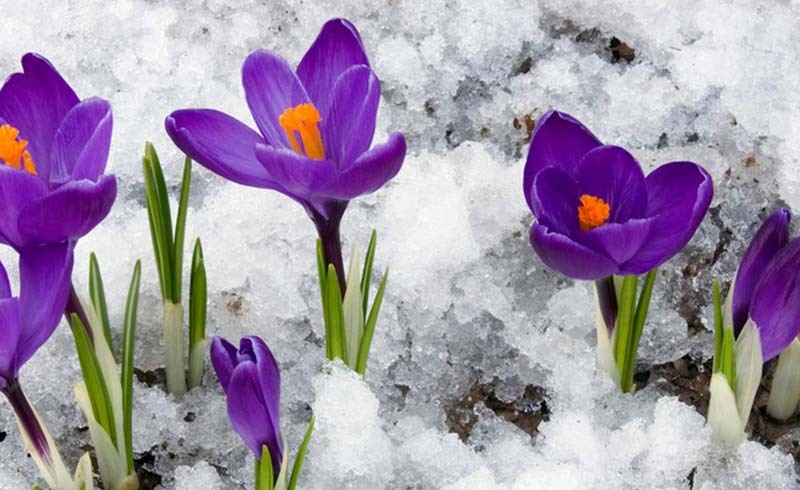 And many will flower in the late winter or early spring to give a much-anticipated boost to your garden. The snowdrop (Zones 3 – 7) is usually first to appear in January, but other early garden guests include crocuses (Zones 3 – 7), fritillarias (Zones 5 – 7S/9W), and iris (Zones 5 – 9). Plant en masse to get maximum benefit, and don’t forget to grow a few in patio pots so you can see them from the coziness of your house. 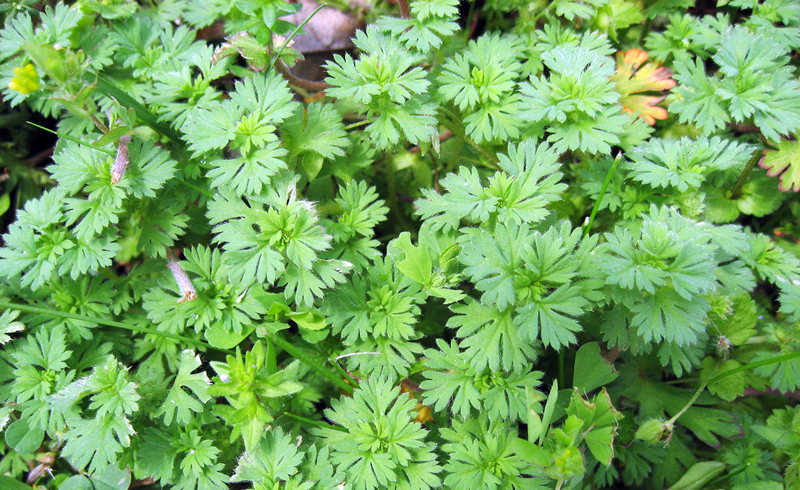 Ground cover plants are a great way to keep the weeds in check, but by choosing varieties that flower in winter, they can serve double duty by providing some greenery too. Many varieties of thyme (Zones 2 – 10) will continue to flourish in winter, especially if planted in a sheltered spot. Evergreen candytuft (iberis sempervirens, Zones 3 – 8) not only has green foliage in winter, but also a pretty white flower in spring too. European ginger (asarum europaeum, Zones 4 – 8) has glossy, heart-shaped leaves all through the winter, while bugleweed (ajuga, Zones 3 – 9) “Burgundy Glow has stunning pink, green and white leaves. Many climbers offer a beautiful way to keep interest going in the winter. Several varieties of clematis are evergreen (Zones 7 – 9), some with colorful flowers. The Star Jasmine (trachelospermum jasminoides, Zones 7 – 12)), is covered in scented flowers throughout the summer, while its leaves turn striking shades of red and bronze in the winter. 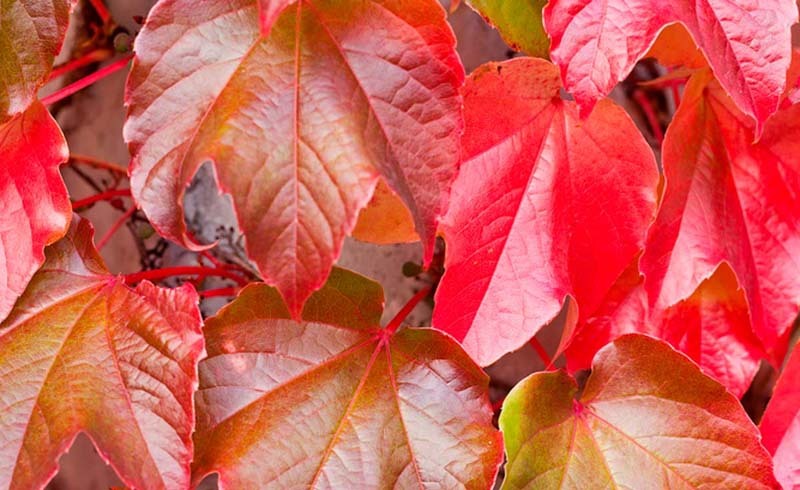 And the old faithful Red Ivy, also known as the Virginia Creeper (Zones 4 – 9), puts on a fabulous show of red leaves as the fall progresses. Evergreen trees and shrubs are a good way to keep color in your backyard all year. The Hinoki cypress “Yellow Ribbon” (Zones 4 – 8) is a fantastic half-and-half mix of deep emerald and golden yellow. Of course, holly (Zones 3 – 11) is a staple of seasonal decorations – here are 29 holiday décor ideas to inspire you! And with the holly comes the ivy, so choose variegated leaves like Goldchild (green and gold leaves, Zones 6 – 10), Glacier (green and white, Zones 5 – 9), or Green Ripple (also green and white, Zones 5 – 10) to make a real statement. Nothing captures the spirit of a winter garden better than a display of colorful berries to catch the eye. 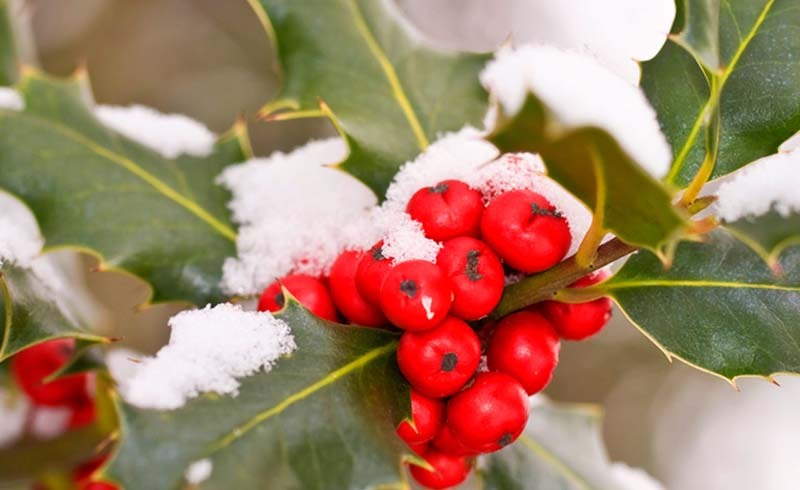 Plant holly such as winterberry (Zones 3 – 9) for scarlet berries, chokecherry (prunus virginiana, Zones 2 – 6) for maroon, and chinaberry (melia azedarach, Zones 8 – 15) for yellow. Firethorn (pyracantha, (Zones 6 – 9) can produce red or orange berries in abundance, and these are especially popular with hungry birds when other food is scarce. If it’s colorful branches you’re after, then there’s plenty of choice. The corylus “Harry’s Lauder’s Walking Stick” (Zones 4 – 8) has colorful, contorted branches, as well as catkins in the late winter and early spring. Some varieties of willow, such as the salix alba (Zones 4 – 9), have colorful stems – you can even weave them into living structures to make the most of their impact. 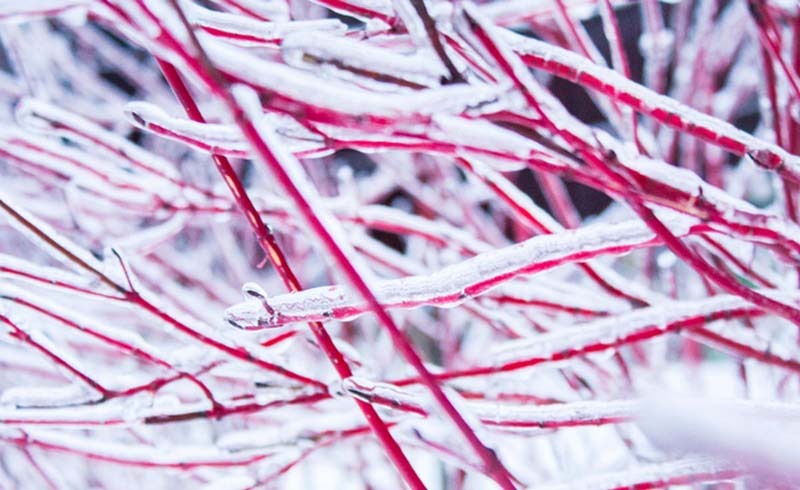 And the dogwood (cornus, Zones 5 – 9) produces eye-catching stems in vibrant reds and yellows that shine even in the snow. Many trees also have colorful bark. The Western Himalayan Silver Birch (Betula utilis var jacquemontii, (Zones 4 – 7) is pure white, while the Alpine Snow Gum (Eucalyptus pauciflora, Zones 8 – 10) has patchy bark that looks as though it’s painted with watercolors. And the glossy red bark of the Tibetan Cherry Tree (prunus serrula, Zones 5 – 8) looks stunning in the snow. Winter vegetables give you double the value for your money. Not only do they look great in winter, but you can eat them too! 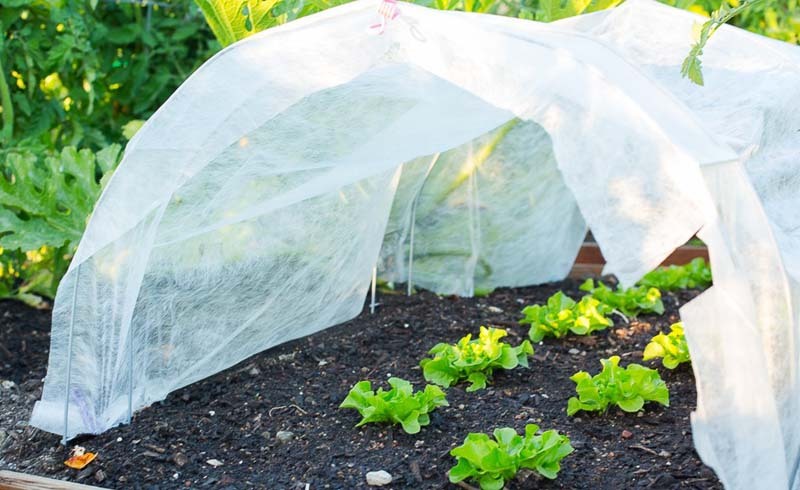 Cabbages (Zones 6 – 11) will grow sturdily onwards in truly harsh conditions, while some vegetables like Brussels sprouts (Zones 2 – 10) actually taste better after they’ve been subjected to frost. Kale (Zones 7 – 9) and rainbow chard (Zone 6 upwards) are pretty hardy vegetables too. 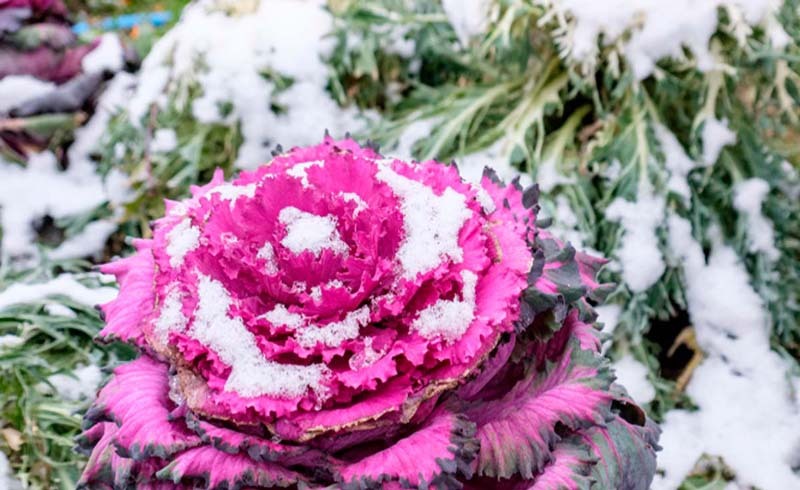 You can choose to grow ornamental cabbages (like the one shown here), which look spectacular in the snow, but don’t try to eat these – they’re strictly for show! You might think the heady scents of summer are entirely absent in a winter garden but surprisingly some winter-flowering plants produce a heavenly aroma that’s sorely needed in the dark, cold months. Skimmia is well-known for its red berries, but the Skimmia confusa “Kew Green” (Zones 9 – 10) bears scented white flowers instead. Unusually, the honeysuckle “Winter Beauty” (Zones 4 – 8) flowers in winter, forming delicately scented white flowers on bare branches. Witch-hazel is renowned for its aroma, but not all varieties are scented (although they do flower in winter). 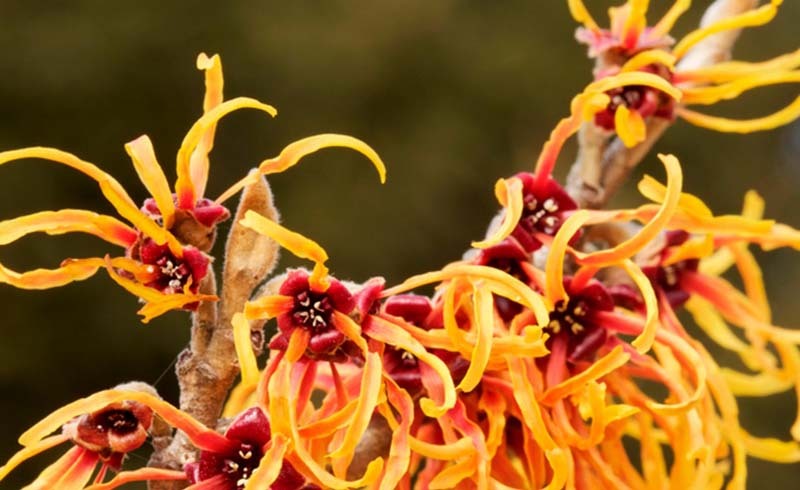 However, the hamamelis intermedia “Vesna” (Zones 5 – 9) has orange flowers with a powerful scent. Did you know witch-hazel is a powerful natural insect repellent? Color and scent are much prized in a winter garden, but the ice, snow and frost can produce some truly spectacular textures in the low sun. 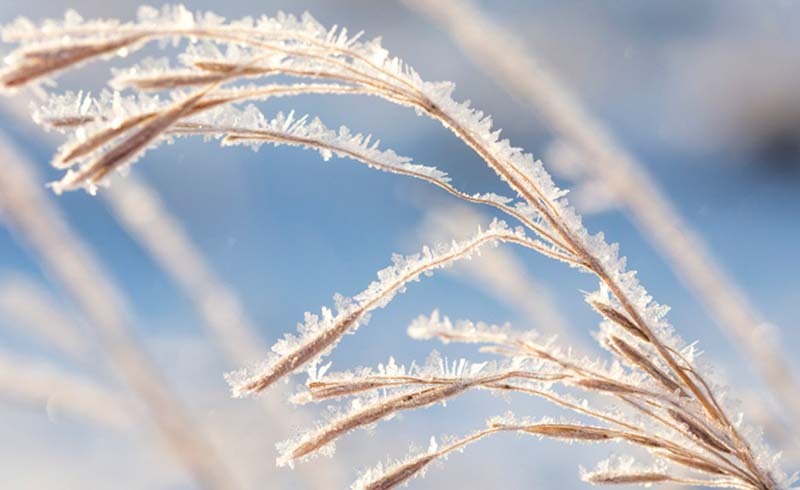 Ornamental grasses are the perfect backdrop for textural displays, with varieties of miscanthus like Silvergrass (Zones 4 – 9) and Maiden grass (Zones 5 – 9) which are both popular choices. Reed grass (Zones 4 – 9) and pampas grass (Zones 4 – 10) also provide beautiful textures. Seed pods are another superb way to add texture to your winter garden. Oriental poppies (Zones 3 – 9) not only have striking bulbous seed heads, but in time these disintegrate into delicate skeletons that allow the sun to shine through. Chinese lanterns (physalis, Zones 3-9) have glowing orange seeds pods in the fall, honesty (lunara annua, Zones 4-8) has paper-thin translucent oval pods and Love-in-a-Mist (nigella, Zones 2 – 11) has spiky pods. 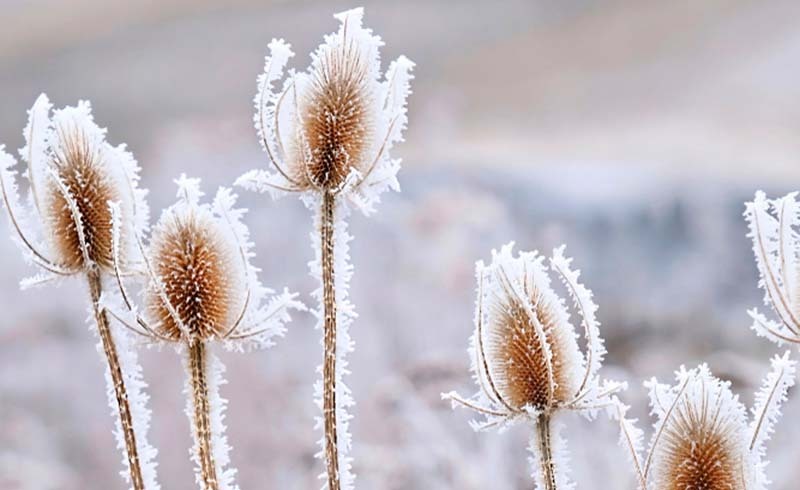 And the thorny hooked heads of the teasel (Zones 3 – 9) are beautiful when encrusted with frost.